After completing the Masters of Business Administration program, at American International UniversityBangladesh, I, Md. Aminul Islam the author of this report was placed by myself at Grey Advertising Bangladesh Limited as part of the internship program requirements. The internship program is designed to have the real life working experience in a well-established reputed organization to satisfy the core requirements of the post graduation program. This report is prepared for in depth study of the agency function of Grey Advertising Bangladesh Limited. One part of the report is focused on the Organization of Grey Advertising Bangladesh Limited and other part is based on the schedule of twelve weeks commitment assigned by the administration of Grey Advertising Bangladesh Limited to learn the actual working environment and to find out the process and prospects of agency function of Grey Advertising Bangladesh Limited. Both of these study exposure the keynote of this report. Generally: To study the Advertising agency function, observe and familiarize the relationship of Grey advertising Bangladesh Ltd. with its’ clients. Presentation of an introduction to the organization “Grey Advertising Bangladesh Ltd”. as a whole. To observe and practice the operations of Advertising Agency. To observe and practice clients interactions (service) of Grey advertising Bangladesh Ltd.
To observe what method actually they applied as a marketing tool to satisfy their Clients. To recommend concerning some important issues base on the findings from Grey advertising Bangladesh Ltd. The scope of this report is limited to the overall description of the company, it’s services, and it’s position in the market and its marketing strategy. The scope of the study is limited to organizational setup, functions, and performances. The report is originated from both secondary sources and primary sources of information. In my study, I have been assigned personal interactions with the organizational people to conduct the research activity. a) Primary Data: I have collected primary information by interviewing employees; Primary data were mostly derived from the discussion with the employees of the organization. b) Secondary Data: I have elaborated different types of secondary data in my research. I have been tried my best to provide with all necessary information about Grey advertising Bangladesh Ltd. supplied by the manager’s and employees best abilities; but due to the exhaustive nature of this study most secret and strategic ethics could not be brought in this report. The information regarding the competitors is difficult. To get and to acquaint information is very limited. – A network that works. Bangladesh Agency Of The Year, 2004 at the Srijon Samman Awards held in Kolkata, august 14 Plus Two Gold, One Silver, One Bronze for Media Innovation, Print Advertising, and Outdoor Innovation. “I am astonished at the way you guys are networked and why one needs a truly international agency” – Kapil Dhameja, Country Manager GSK. “Mediacom has brought a sea-change to the way we planned our Media Investments in the past. They are more concerned about the mkt share of our brands than some of the brand managers themselves. Advertising agency is firms where they solve generally the marketing problem of clients help to launch new product, sometimes change the image of the company, fend off competitors with a creative idea and planning for the clients and their products. The Glamour boy of Industry! Simply Advertising agency is a part of each organization that does marketing and advertisement of the brand. In this brief client discusses about any marketing problem, launch a new product, change the image of the company, defend market-share, fend of competitors etc. Here any executive from account management department takes the brief from the client. Then the Account management Analysis the advertising strategy with their planning cycle. Where they make out their plan-cycle, according to the clients requirement (like: brand, competition, consumer bond, trade scenario etc), arriving at the most realistic scenario they analyze their brand objective, brand positioning, brand personality etc. – What is the core value of the brand? – Should this be enhanced or evolved? – In which consumer segment does the brand compete? – Which are the other brands in this segment? Target Consumer: Who are we talking to? -What does consumer currently think & feel about our brand? Advertising objective: What role must advertising accomplish? Desired Perception: What do we want our consumer to think & feel about our brand? Single minded proposition: What single benefit should we promise to our customer? -What is the single thought that consumers need to take away from the advertising to enhance their perceived value of the brand and/or stimulate action? Choice of Media: What media do you think is most suitable foe advertising to achieve its goal? Yes, if all the answers is ‘Yes’ then the process is approve by creative. When everything is planned then the creative works go for final stage which is production. In this stage processing and printing is concerned with the various elements like Letterpress printing, Silk screen-printing or off set printing etc. In an advertising agency primarily media functions are divided in to three steps. Media Strategy: Based on Media Brief given. Media Operations: Agency-Media house interactions. Among these three steps AOR is discussed in the stage of Media planning. Here AOR can ensure the client that how effectively the budget is spending. What is Agency Of Record (AOR)? AOR means Agency Of Record. Agency of Record mainly operated by the department of Media. Other departments also support the AOR, because it directly plays an important role in the profitability of an agency. On the other hand we can say a recorded agency for a client for their media buying. Normally Large companies hire an advertising agency for their promotional works. An advertising agency provides three types of services like creative, media and account management (client servicing). In part of media agency propose media plan to client for any particular brand and to make the media plan successful. Company nominates an agency for their media buying. This is in advertising terms called AOR. (Agency of record). Centralized media buying with a single agency by various clients allows the agency to deal with vast sums of money which in term increase their clout with the media (press, TV, Radio, Internet, Outdoor). If Brand X is handled by Agency M they would be buying media for only 20 million BDT. If Brand Y is handled by Agency N they would be buying media for only 40 million BDT. If Brand Z is handled by Agency O they would be buying media for only 80 million BDT. However if company A has appoint an advertising agency P for handling their entire portfolio the budget works out for 140 million BDT. Lets say Agency P also handles the portfolios of company B with their another two brands worth 200 million BDT & Company C with their five more brands which has media budget of 160 million taka, then the total buying power of agency P would be equivalent to 500 million taka. So that they can buy the media time/space through one’s budget. Where obviously every one gets benefited in this process which is basically indicates their win-win situation. For lots of reasons agency could offer better price because for their bulk purchase and long term agreement, they get higher discount than general clients. Like example if a general client wants a unit of space of a TV channel, he/she has to pay fully but most of the time for agency one unit free with one unit purchases, so here agency could offer discount for their clients. If any company wants to launch new brands in the market where it has other existing brands in the market now then the company has to spend a certain amount of money for launch ad where at that moment there was no direct return from that new brand. In this situation the company pays the ad cost from its own fund. If there will be an AOR with any advertising agency then the company gets a avings form the agency on its ads. By which the new brand can be advertised. There are many organizations and companies who are giving there corporate ads. Through these ads they deliver such messages which include necessary information for the general people. Like no Tobacco for young, advertised by BAT Bangladesh Ltd, for afforest ration Dutch Bangla Bank is giving ads for interest public interest etc. These types of ads do not give any direct return to the company but these ads have some value. It costs a large amount of money. If any company maintains its’ AOR with any agency then they utilize its savings on ad to these type of corporate ads. Client has different type of jobs according to their activities. For this they have to contact with the media house frequently. But in the media there are so many clutters are existing that’s why it is not sure that any fixed brand can get space/spot according to their wish. When any client has AOR with any advertising agency then the agency tries to arrange to book the space or slot for their respective client. And ultimately the benefits go to the client. Beside this there are other factors that motivate the media house to follow the agencies instruction. That is when any client gives their ad to any media directly then they offer the media a certain amount of money that they can not exceed. But the agency gives ad for its clients to the media which is obviously more than any single company media spent. So when any media gets higher order from any source then try to keep that client continues because it is a matter of their profit. It is noticed that when any media gets higher billing from any of their client who are mainly advertising agency the media gives more prior to them coz more billing means more profit for the media. So media always provides special support to their clients. On the other hand the benefit that is offered to agency from the media the agency tries to transfer that benefit to their own client who maintains AOR because of the same reason. An advertising agency always tries to keep with their fixed clients. For this they offer the client to maintain AOR by which the client makes its all media spent through that particular agency for any specific brand. Because of that the movement of client is not that much possible. Client is getting support from their respective agency through various ways. Market research is one of them. Agency does the market research for their valuable client to keep a continuous relation with them. Relation through AOR makes the agency interested to do this for their client. Most of the time agencies are liable for all kind of promotional event. Clients do not have to worry about the advertising for their promotional activities. Because as support agency makes the plan for promotional activity for any clients brand and according to that plan follow a media plan which helps the client to evaluate their activities. When any advertising agency find that this particular client gives them more profit through different activities then the agency gives their best afford to that client. And because of this dedication client gets its job on time as well as the media spot according to their choice (most of the time). If any client does not maintain AOR with the agency then they can do their media spent through any other agency any time. But when the AOR exists then the fixed agency is responsible for their media spent, which is directly linked with the profitability of the agency. It is very simple that AOR increase the gross sells of the agency. Coz then the client is bound to have their media spent through that particular agency. According to the activities of AOR agency can place more order to the media house more order implies a large number of money that client wants to spend in that media. It is direct profit to the media. Then the bargaining power goes to the agency and agency can gain the best rate for their client. Always there is a card rate for every media. And media wants to control that card rate where they can avoid the bargaining process and become more profitable. But the agency goes to the media with a large number of orders for different brands then the media gives a certain amount of discount on that media card rate. From there the agency can provide a part of profit or discount to their client. Then client gets satisfied. Because the client may not able be to get that discounted rate from the media house. When any agency bargain with the media for their client then and gets a better rate then other agency tries to get the same benefit from that particular media house and the price competency comes. The competition is basically helpful for the clients. On the other hand when any client found the cheaper rate arranged by any particular agency then those clients try to move towards that agency which is a part of agency profitability. The newspaper is a very important type of media in our country. When any newspaper gets frequent ads from any advertising agency then the publishers give commission for their clients. Besides the profitability agency can create more value for client’s satisfaction. Like agency can provide more ideas for any specific brand. With these ideas and research outputs can help the client to make a clear focus about their market. Here is a list of agency services that may be required. Each category should be considered in detail, before finalizing a AOR system. The advertising concept in our country is not very old. Few years back there were the companies was not that much aware about the advertising of their brands? Most of all the route of media was limited. Now a days the popularity and necessity of advertising increases. So, that the competition is increasing in the market as well as the competition among the agencies also increasing. Now there are many advertising agencies both local and multinational are running their business in this country. \But the concept AOR (Agency of record) is really very new. Grey Bangladesh Ltd. first introduced it in Bangladesh in 1998. 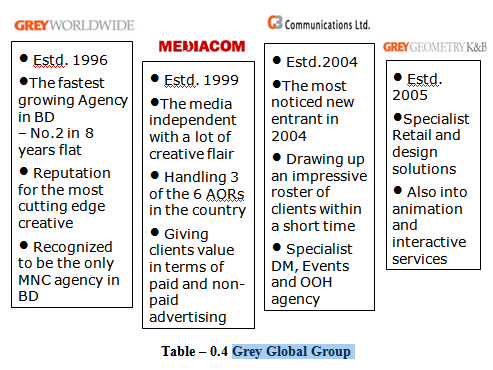 In 1998 British American Tobacco Bangladesh ltd. nominated Grey Bangladesh Ltd. as their agency for media buying. From then AOR started. \Now there are many other clients who are maintaining AOR with their respective clients. Like Grey Bangladesh Ltd. Buys the media for GSK, P&G, BAT, Reckit & Benckizer, Apollo Hospital, Otobi, etc. Now the AOR concept becomes more popular. All most in all developed countries in this word AOR is a common theme to the clients. Now I show an AOR work flow to which agency and client both are working. Part – IV: Major Findings. a) As AOR is not that much popular in our country so the number of agencies who uses AOR wants to make it easier and understandable. Lack of awareness is a reason working behind it. The percentage of agencies who are using AOR are given. Few agencies fully understand accountability. Not clearly concept about AOR. They are not readily applying it to gain advantage. They think developing full accountability can give them a powerful competitive edge in implementing strategy. The above diagram shows that about 60 percent large clients, 21 percent medium clients and 5 percent smaller clients maintaining the AOR. The clients benefits from all the agencies services at no additional cost. Once the Medias plan is place, the clients know what will be paying their agency and the agency knows what it will be receiving. Put pressure on an agency to keep it cost down. When the advertising is cancelled to save money, media remuneration to the agency is also reduced. Addressing the issue of agency profit. Providing information on media only. To maintain AOR that ensures focus on the more important agency relationship. AOR is unlike a cost based system, an agency may make profit on some brands while losing money on others. High risk on new product development work. Agency recommendations for higher expenditure may be perceived as self-serving. The agency’s payments are based on the price medium charges and not on their work; i.e. : agencies and not compensated for undoing media buys. e) The reasons for what clients want to maintain AOR are dependent on clients’ extra benefit. Client wants more media buying with limited worth of money. When they are maintaining AOR with any advertising agency then they gets extra benefits from media house like more space or spot than the regular slots. Besides these there are many forms of financial benefits. When any client maintains its AOR with an agency then they have to declare their budget for media spent for that particular year break up to the months planned by their respective agency. SO the plan for the clients media spent to right media according to their different activities like promotion or other are made by the agency. This is also made the client satisfied. a) When any client maintains AOR then their satisfaction level goes up. Because then that client spent their whole media budget through that fixed agency. For this AOR the client wants the value for their money, when this goes smooth then their satisfaction mainly goes up. AOR provides client for better financial planning. Clients pay only for desired agency services. Tends to make clients and agency relationship more efficient. a) There are many advertising agencies now in Bangladesh operating their business including international and local. Not all of this agency are using AOR. Very few of them actually who are comparatively big player exercise AOR. The above diagram shows that about 35% agency uses the AOR and about 65% agency not uses the AOR. It was selected based on a variety of criteria, including experience as a media. AOR, experience in buying major media categories, applied integration of media and targeting tools, staffing plans for the Grey Bangladesh Ltd. welcome their Clients, as well as general philosophies and approaches to the media marketplace. b) AOR is now getting its popularity for its various types of benefits. Though increase profitability is the main objective of maintaining AOR there are man other benefits of AOR. In the above diagram I use four options for collecting AOR benefit. This diagram shows that about 40% agency uses AOR for profitability, about 22% agency uses AOR for media control, about 20% agency uses AOR for client relationship and about 18% agency uses AOR for client’s number. The specialized agencies, often buying is more markets or in greater quantities than some advertising agencies, may deliver media at greater efficiency. Like full-service agencies, media buying services have a range of AOR arrangements, depending on the volume of business handle. Significant economics of scale can be gained the larger the media assignment, conversely as the volume decreases or the target group narrows from a demographic, psychographic, or geographic perspective, additional AOR may be required. c) The relation between AOR and clients satisfaction is very closer. Client always wants more media space with their limited budget. When AOR is maintained by the agency and the client then the bonus spot forms the media with that they can show their higher presence in the media.